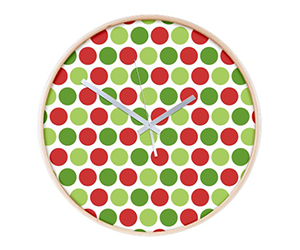 Find a wall that would suit the colorful Christmas Polka Dots Wall Clock and it will surely look splendid for the winter holidays to come! The clock makes impression with its size and funny dial which is absolutely in harmony with the Christmas spirit! The appearance of the polka dots wall clock is also stylish, because it has a nice wooden frame, more specifically – a birch one. Happy holidays!